Ilfracombe in North Devon is a bustling, atmospheric harbour and seafront holiday resort town with plenty of delights for visitors. The town centre is dominated by the Hillsborough Hill. The seafront extends east from the Coastguard Cottages of Hele Bay and four miles west to Lee Bay, along The Torrs. Book today the best rates for budget friendly hotels and seafront guest houses or cheap b&b’s in and around the elegant seaside resort of Ilfracombe. The coastline is both ruggedly stunning and breathtaking in its beauty which makes it the perfect place for a romantic getaway or family holiday. Many bed and breakfast establishments are set in beautiful Victorian townhouses and offer a full English breakfast in the morning. Popular is a visit to Tunnels Beaches. The resort lies within the North Devon Areas of Outstanding Natural Beauty. The coast is also a part of the Voluntary Marine Conservation area of North Devon, because of its varied and rare marine wildlife. The town itself has several small attractive beaches, yet its only a 5-minute drive away from the sandy expanses of Woolacombe, Croyde and Sauton. These beaches are a haven for surfers, body boarders, kite surfers and the bucket and spade brigade. The town itself offers a wide variety of activities, including sea fishing, golfing, quad biking, horse riding and walking (including the Tarka Trail and the Coastal Path). The Green Flag award-winning Bicclescombe Park is nearby. Since it is a resort of many years with an excellent reputation among local and international travellers, Ilfracombe offers a wide spectrum of luxury and cheap hotels, B&B’s and guest houses for the holidaymaker. Besides traditional hotels, there are plenty of first class seafront guest houses and bed and breakfast as alternative and homey places to stay. Guests will find accommodation styles to suit their tastes, whether it is rustic or modern. Visitors that opt for convenience as opposed to secluded relaxation may look for places to stay closer to the town centre. Most bed and breakfast and hotels in the area have rooms that offer panoramic views over the harbour or over the rolling Devon hillside. B&B’s offer comfortable and charming family rooms that allow larger groups of travellers to comfortably base themselves. Most hotel rooms, bed and breakfast, and family rooms are clean and well-equipped with televisions, tea and coffee makers, comfortable bedding, Wi Fi etc. to offer a relaxing getaway in this part of the United Kingdom. The town centre has a lot of bars, bistros, restaurants and pubs offering a variety of nightlife to suit all tastes. There is also the Landmark Theatre, which offers a choice of plays, bands and films throughout the year. It’s the perfect base from which to explore the wonders of North Devon, nearby you will find stunning coastal walks, rock pools, sandy beaches, surfing, golf courses, award-winning restaurants and traditional country pubs. Tunnels Beaches, the picturesque harbour, golf club and museum are all within easy reach of most properties. Not only are the town’s cheap hotels and bed and breakfasts excellent for exploring the rest of North Devon, it offers rugged cliffs and dramatic coastlines, fantastic beaches, adventure parks, historic museums, castle gardens and railways within its immediate perimeter. Holiday makers interested in the history of the area can spend a day exploring the Iron Age Hillfort or the reputedly haunted manor house at Chambercombe. They can also take a ride on a steam train from the Minehead train station or on a narrow gauge track at the Woody bay train station. More sporty visitors can enjoy the many walking or cycling trails (part of the National Cycle Network cuts through the area) in the hillside, indoor sports, fishing or cruises that go up to the stunning and secluded Lundy Island. Cultural explorers may like to check out the Landmark Theatre, which stages a variety of comedy, musical, classic and variety productions throughout the year. 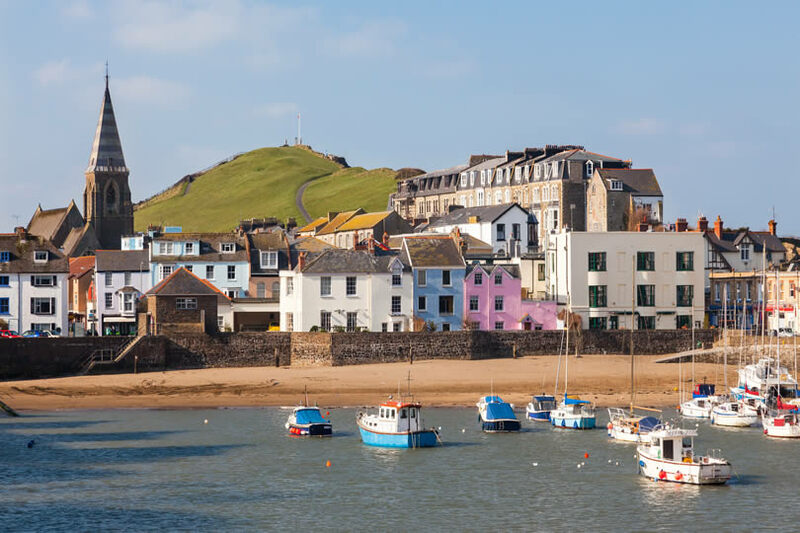 Ilfracombe is also home to six carnival celebrations in the year, including May Day, a Victorian celebration in June, a sea festival in September and the lighting of a Christingle at Christmas. Fine gastronomic delights and a fortnightly Farmer’s market near the town centre complete a fantastic local holiday. 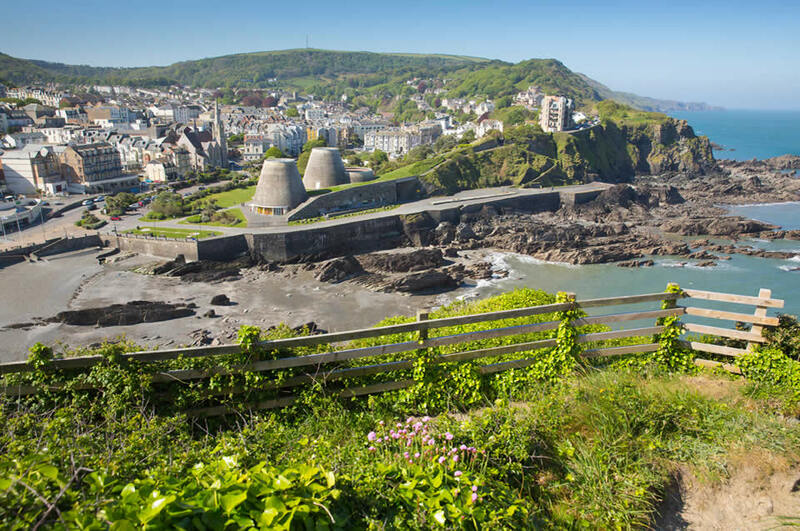 This makes Ilfracombe a wonderful destination for individuals and families that want to get close to nature while still enjoying the creature comforts that a well-established resort town has to offer. Intercity trains travel to Exeter. Here you can change to the scenic Tarka Line for onward rail travel to Barnstaple. From Barnstaple they are coach bus or taxi connections to Ilfracombe. Alternatively you can travel by coach (National Express) from London Victoria coach station and other major cities and towns. Most connect or transfer at Taunton, Exeter or Barnstaple with some direct routes to Ilfracombe. Book cheapest b&b deals in the UK. This seaside town is located on the North Devon coast in south-western England. It’s harbour is the largest one on this coastline. The county of Devon shares his borders with Cornwall, Dorset and Somerset. The town centre is around 2 hours drive from Bristol. Ilfracombe is within easy reach of Exeter international airport, from where you can fly both domestic or international. Another major international airport in the wider region is Cardiff CWL airport in Wales, just over 150 miles away (you can find several hotels and b&b’s nearby). It’s a great tourist attraction and wedding venue. Popular place to get married. The tunnels themselves provide unique access to a beautiful area of coastline. The hand carved tunnels are leading to sheltered beaches and a Victorian tidal bathing pool. Small interesting museum displaying an interesting array of exhibits. Castle home to a collection of Victorian antiques, animated displays, mechanical musical instruments, a unique arcade of pier slot machines, Gnomeland, Adventureland, Dungeon Labyrinth and a family theme park. The surroundings of the castle features wonderful landscaped gardens, with plenty of space for strolling and relaxing, and glorious woodland walks. Wildlife park home to several species of wildlife, animatronic dinosaurs, shows, and much more. This wildlife park is a great day out for the whole family. Find your bed and breakfast : stay overnight in a cosy or charming b&b, nearby a beach with splendid sea views. Many tourist attractions are located within close distance.